Dental care is one of the most expensive health care visits there is out there, and a single trip can cost one a lot. Proper brushing with a modern electric toothbrush like Oral B Precision Black 7000 is recommended. But it can still land you in the dentist office with cavities, plaques, grits and much more because regular brushing does not do enough for your teeth, gums and overall oral health. What one needs is actually an electric toothbrush. A lot of people are skeptical about it, but that is until they start using it. What an electric toothbrush does is it that it gives you the service similar to the dental office, but at home on a regular basis. The results are healthy pink gums and white teeth that you can flaunt every day without having to dish out thousands at the dentist’s office. What this app from Oral B does it that it gives the user real-time feedback on everything that is going on inside their mouth. From how you are brushing, to the time you need to continue doing it to the amount of pressure required, you get all of this knowledge from the app. Over time the app will take in your habits and recommend the times and pressures perfect for your oral health and will also send out tips you could use for better teeth and gums. Bluetooth itself is a feature that is available on pretty much every device on the planet today, so it makes sense that it has made its way to our toothbrushes as well. This Bluetooth feature connects your toothbrush SmartGuide to your smartphone where it gives you information on your brushing habits. While regular manual brushes come with liner bristles that can only go sideways and back and forth while cleaning, this does a lot more. First of all, this has a round brush head instead of an elongated one, which helps to reach each tooth individually for a perfect clean. Then comes the angled bristles which can go inside little gaps for effective and proper cleansing. The cross-action feature helps to get rid of food from every space. A manual toothbrush cleans the way you would move your arms, which is only front to back and side to side. 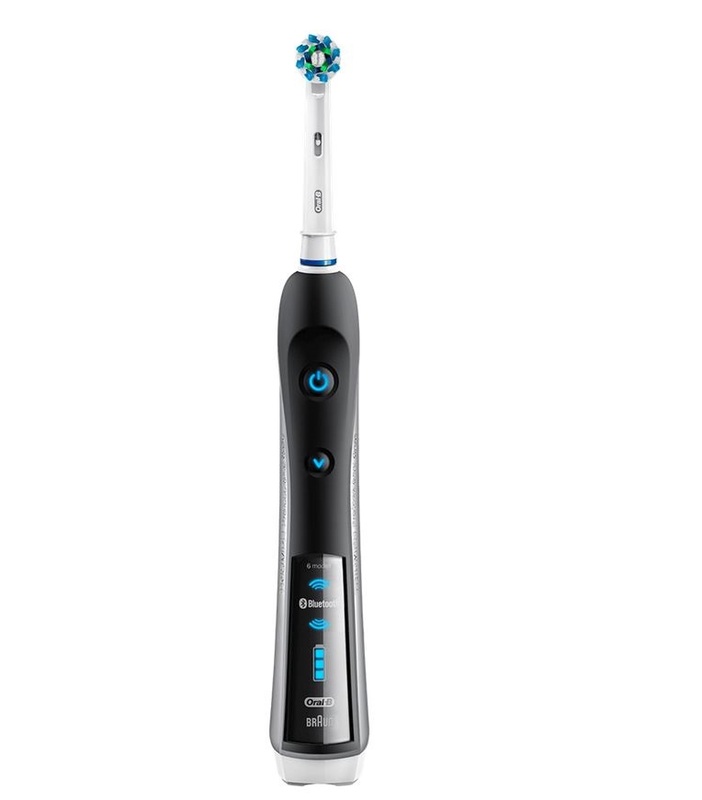 The Oral B 7000 brush, however, has a 3D cleaning feature which means it can go many more ways. It oscillates to clean the top, rotates to get every corner and pulsates to get rid of plaque effectively. All of this together gives a 360-degree service to your tooth every day for a clean white and biofilm free tooth. The Daily Clean mode is what is to be used every day for a moderate cleaning. Gum Care helps to keep the gums healthy and pink. The sensitive mode is for those who naturally have sensitive teeth, or have gum or a toothache occasionally and need softened pressure on their teeth. The Whitening Mode helps to get rid of stains for clean and white teeth. The tongue cleaner mode is like an added bonus which helps to clean the tongue giving complete oral care. A few owners of Oral B Precision Black 7000 said that they did not like the product very much and found the app and Bluetooth features to be completely useless. They did not like the tongue mode and believe it does not do much. There were also complaints about the design of the brush, namely the color combinations which some found to be very contrasting. A couple of users also found the flickering blue light to be very annoying, and others think it is priced too high for its features. Many users said that this has changed their entire brushing routine and has helped them achieve a proper brushing schedule which they used to lack. Many credit the app and Bluetooth for this, which has helped them build an oral care plan, and over time healthy pink gums and white teeth were what they achieved. Some, however, did not make use of the different brush head options and felt they are not very necessary and push the price up. These buyers would prefer a cheaper model with lesser features which everyone gets some use out of. A few users have said that this does not last very long, mainly because of the battery which drains way too quickly for the Bluetooth function. Even connecting it to the charger at all times has not helped some people very much. People have mentioned they prefer other models of Oral B to this one. The timer is a great feature for it allows one to carefully asses the amount of time they need for their own teeth. Especially for people suffering from oral diseases, this is a beneficial feature because it helps them maintain a routine instead of spending too much or too less time on brushing. The Bluetooth feature is an excellent feature for people who dislike brushing or are just too lazy to brush their teeth. This is especially great for kids because it gives them motivation and a side job, and makes the whole experience of using the brush a lot more exciting. While being able to see what is happening, the pressure on the teeth, the modes and all other exciting features in the app serve as a motivation for one to actually brush their teeth. It gives the feel of a professional clean from a dentist’s office. Using this every day can help one achieve white teeth like the one a dentist would provide except this can be done at home at a lower price and without having to visit the dental office over and over again. At the end of a month’s use, one can see visible results that would mimic professional cleaning. The traveling case it comes with is convenient as well. A lot of times it can get hard to find just the right bag to carry an electric toothbrush, but not bringing it not an option either. So, this travel case not only looks good but is also very useful as well, great for those trips. A con of the Oral B 7000 model is the battery which needs to be recharged very often. Although it is not bad, some users feel like it should be better for such a high price tag. The price tag is also a con for a lot of people because it is very highly priced even for an electric toothbrush. A lot of people are not willing to invest so much in something as small as this, especially when there are similar models in the market at lot lesser prices. Sometimes the toothpaste can leak downwards into the handle, and it becomes very messy. Although this is common for toothbrushes, users do not want such trouble after paying so much for it. Another con is the sound that comes out of it. It has been bothersome and very loud for a lot of users. Comparison with Oral B 5000 is coming soon! Comparison with Philips Sonicare DiamondClean is coming soon!